The following essay was written by film critic John Marks, a contributor at Movie Mezzanine.com. Is Oscar-bait good for the movies? This was the question asked by Slate’s S.T. VanAirsdale in 2012. VanAirsdale’s provocative answer was: yes, very much so. “Oscar bait is the only reason that grown-ups have anything at all to watch in a movie theater anymore,” VanAirsdale wrote, “with four months of awards season compensating for the other eight months of craven superhero franchises, anemic romantic comedies, and whatever Adam Sandler wipes off his shoe.” As Hollywood has narrowed its ambitions – so went VanAirsdale’s argument – Oscar-bait has shielded interesting filmmakers against the annual tidal wave of reboots and CGI. Still, there’s a whole lot to argue against Oscar-bait, which often feels like its own mid-December tidal wave of awfulness. Critics complain so regularly about the Academy’s predictable tastes – a mixture of self-congratulatory political “awareness” and glossy historical subject matter – that it has become almost as much a feature of the season as the awards themselves. But I’ve detected a drop-off in the amount of Oscar cynicism among film critics lately. The brief hiatus of franchised, prefab blockbusters is greeted with something like a sigh of relief, as grateful reviewers look forward to a season without superheroes or Transformers in their lives. 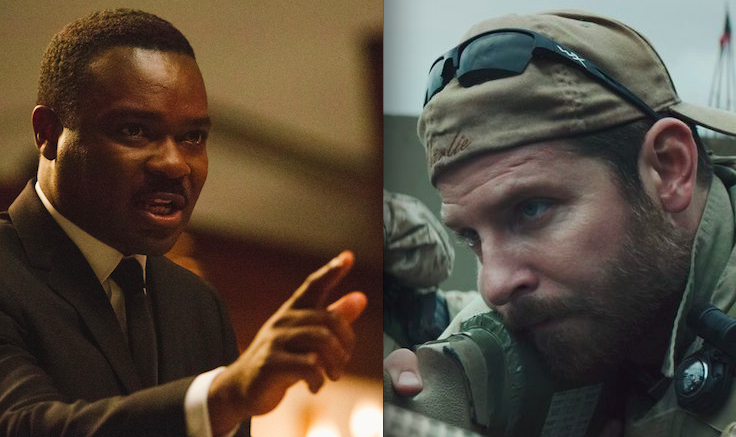 As evidence, I’ll point to two Grade-A pieces of Oscar-bait released last season without a single whimper of protest from critics: the Iraq War portrait “American Sniper,” and the MLK biopic “Selma.” Both released on December 25th (the richest stretch of the four-month window from which most Oscar nominees are drawn), these films wear their Oscar pretentions on their sleeve – one centers around historical injustice (“Selma”), the other is a war movie (“Sniper”), and both are biopics set in the historical past. Yet scarcely a review mentioned the dreaded phrase. Given their polarized reception in the media, a casual observer would be justified in thinking of these movies as aesthetic and political opposites. “Sniper” was a film by a conservative director that split commentators along political lines, inspiring some fairly hysterical overreactions both ways (peaking with red state-baiter Lindy West’s labeling of Chris Kyle as a “hate-filled killer”), while “Selma” was a valorization of a progressive hero. “Sniper”’s controversy contrasted sharply with “Selma”’s universal praise, captured by the film’s 99 percent “fresh” rating on Rotten Tomatoes. 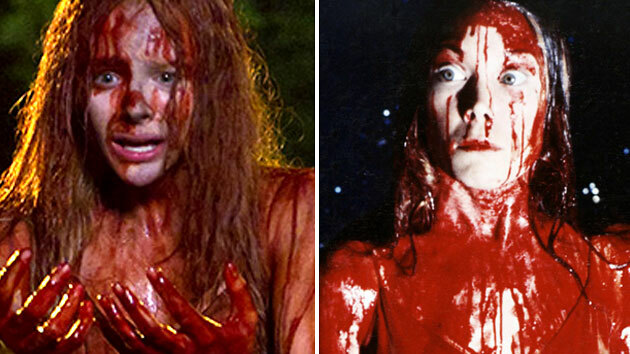 But this coverage obscured the films’ similarities, which far outweighed their differences. For one, the commercial success of both was predicated on being nominated for an Oscar, an obligation that impacted them from script to postproduction. Appealing to the Academy means tickling the tastes of a society that’s about as homogenous – geographically, ideologically, and aesthetically – as the Bilderberg Group. As such, films greenlit specifically for this purpose (as opposed to stumbling accidentally upon it, such as “Boyhood,” released in the decidedly un-Oscar-y month of August) will share a great deal in common. To my mind, their most salient commonality is the massaging of real-life source stories, which in both cases involved the simplification of a complex piece of history into something amenable to a Hollywood narrative. I’ve tried to analyze this bowdlerization below – what was taken out and why. 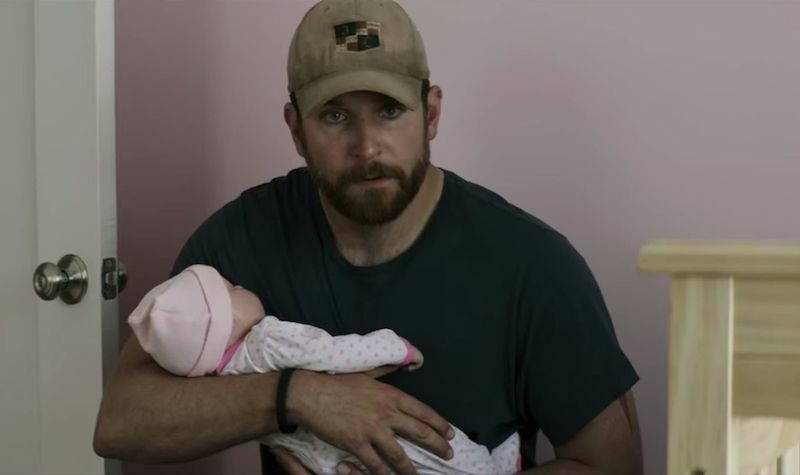 Bradley Cooper in Clint Eastwood’s “American Sniper.” Courtesy of Warner Bros.
What’s surprising is how charitably these omissions were interpreted by the film’s harsher critics, who seemed willing to attribute the shavings to artistic license. 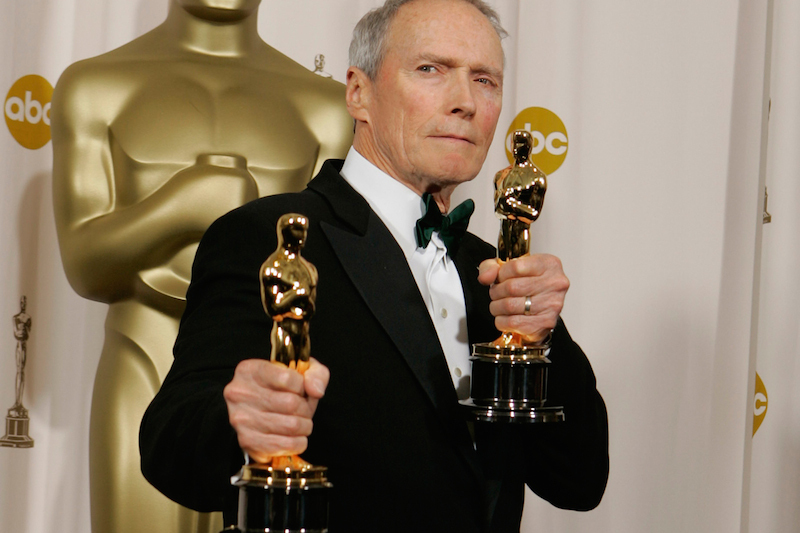 “However we diverge politically,” West went on, “I have enough faith in Eastwood’s artistry and intellect to trust that he is not a black-and-white ideologue – or, at least, that he knows that the limitations of such a worldview would make for an extremely dull movie.” Later still, West quotes Scott Foundas of Variety stating that “Eastwood ‘sees only shades of gray’” – contra the black-and-white chauvinism of Kyle’s memoir. Eastwood removed Kyle’s racism and jingoism, West suggests, for purely aesthetic reasons, in order to produce a portrait of the war rooted in Kyle’s existential dilemma rather than vulgar nationalist rooting interests. There’s a blunter explanation for why “Sniper”’s screenwriters chose to axe Kyle’s un-PC opinions: it made him a more palatable character. One could imagine a version of the film that was faithful to Kyle’s racism and yet preserved the audience’s identification with him – in fact there’s a long line of un-PC anti-heroes in American cinema, from the plainly heroic (Eastwood’s own portrayal of Dirty Harry), to the problematic (Gene Hackman in “The French Connection”), to the psychotic (Travis Bickle in “Taxi Driver.”) But such honesty would not have reassured the film’s Oscar arbiters. The Academy’s members are made up of film industry insiders, and as such they have a vested interest in “protecting” the public profile of Hollywood. Because of this, potentially controversial selections are avoided. Kyle’s inconvenient statements about Iraqis falls under this category – as did John Nash’s bisexuality in “A Beautiful Mind,” the curious political beliefs of Ron Woodruff in “Dallas Buyers Club,” and (very nearly) the heavily downplayed homosexuality of Alan Turing in “The Imitation Game” – all biographical facts banished by their makers’ desire for an Oscar. So far all I’ve done is bash on a film already despised in some corners for its selective memory. But I predict I’ll get considerably more pushback suggesting that “Selma” – a film I’m sure is beloved by some of the people who hated “Sniper” – does something similar to its own biographical subject, Martin Luther King, Jr.
It’s a telling choice. The Selma protests are the high-water mark of the only period of King’s life to receive widespread publicity, his battle against Jim Crow. Left out is King’s nearly-forgotten latter life: his residency in a Chicago ghetto to protest Northern segregation, his stand against the Vietnam War, and the planned Poor People’s Campaign against poverty. This less well-known activism arguably constitutes King’s most vital and challenging legacy for today, as well as presenting the richest opportunity for contextualization and demythologization, the biopic genre’s two most useful functions. (The P.P.C.’s exclusion is particularly conspicuous, given that the relative priorities of race and class already undergirds much of the movie subtextually: King wants Johnson to pass a new civil rights bill, but Johnson wants to wait until after he has passed his War on Poverty legislation.) Is it a coincidence that “Selma” ends right at the point that King’s focus shifted from Jim Crow to more contemporary-feeling targets – the housing segregation of Northern cities, and structural economic inequality? I don’t think so, but it’s inarguable that eliding over these helped the film win over potentially skeptical audiences – and Academy members. I’ll return to the film’s spin of King later. For now let’s move on to the second thumbprint left by the Academy. 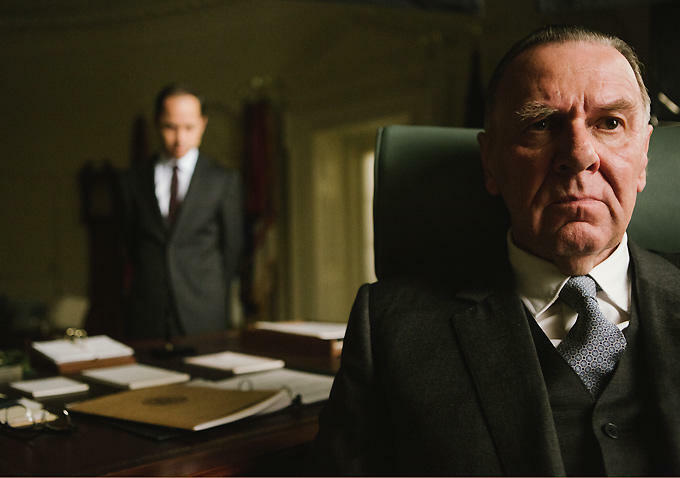 Tom Wilkinson in Ava DuVernay’s “Selma.” Courtesy of Paramount Pictures. 2. Both use technical detail to conceal their dumbing-down. While I never really cared about the fate of its hero, I found “American Sniper” had substantial value as a procedural. From the minutia that shocks us but is shrugged off by Kyle – the way he pees himself rather than taking his eye off the scope – to the strange confusion of time and space wrought by cellphones and the internet – Kyle phones his wife while surveying the battlefield, as she simultaneously surveys casualty stats on TV – “American Sniper” is full of insights into the daily life of a contemporary U.S. soldier. Some of these details can simply be chocked up to the source material (and likely collaboration from the Pentagon, a possible clue to “Sniper”’s values.) More deliberate, however, is the use of production elements to convey a sense of “gritty-realism.” Some examples include an objective, third-person point-of-view, the use of desaturated color (as though the images were captured on the fly), and the sound design of recurring Eastwood collaborator John T. Reitz, all of which suggest a quasi-documentary ruggedness. The procedural elements in “Selma” are more overt, and in some ways less troubling. The film is to a large extent an educational film about the mechanics of civil disobedience (it’s no wonder that Richard Roeper advised middle school teachers to “take a field trip to see this movie.”) A procedural like “Sniper,” the runtime is divided pretty evenly into thirds between: (1.) powwows, the SCLC leaders’ backroom strategizing of the protests. (2.) King’s personal lobbying of President Johnson to pass a civil rights bill. (3.) The protest itself. At times this literal approach can seem downright perverse, since it departs so conspicuously from the typical biopic template. Most Hollywood biopics rush over or even conceal the practical consequences of their character’s “growth arc,” as though the actual achievements of the subject were a waste product of their spiritual self-actualization (I’m thinking specifically of “The Iron Lady” here.) In “Selma,” those practical consequences are all we get. The filmmakers seem to have made the choice to focus exclusively on the material process of the protests and not at all on the principles motivating its participants, whether that be King or the ordinary black citizenry under his leadership (we get almost no sense of the living conditions of an average black southerner.) To my taste, that made for a dry, unsatisfying film; it’s like touring a sausage factory and not getting to taste one afterwards. One way to illustrate what I’m saying is to imagine an alternate cut of “Selma,” one that’s actually more conventional in its construction than the film we got. Starting with the Montgomery bus boycotts, this cut builds into a broader fight across the South, before concluding with the Poor People’s Campaign. In this version, the connecting arc is the evolution of King’s underlying political philosophy: growing from the specific deprivation of black voting rights into a more foundational critique of inequality-qua-inequality (the P.P.C. ), before suddenly being ablated on a balmy evening in 1968 (I admit this approach would have made for a less triumphant ending, but a coda of unfulfilled promise might amplify the story’s resonance: King dies, but his spirit marches on.) Aside from being a lot less dry than “Selma,” this film would actually tell us something we don’t already know about King, and it might even challenge our perceptions. I don’t think it’s a stretch to suggest that the choice to avoid such an approach – which after all is the more typical construction for Hollywood biopics – also serves to reassure risk-averse Academy members. By framing King’s protest as a struggle only against the specific injustices of Jim Crow, the film avoids framing it as part of a wider struggle for black liberation. One consequence of this is that we are not tempted to connect King’s work with our own troubled racial climate. Elsewhere in his foreword, Baldwin writes of the tendency to turn once-controversial figures into “national monuments,” figures of unifying reverence. I suspect the filmmakers wanted to universalize King’s experience by removing those elements most recognizably rooted in the black experience. That would explain why the film provides almost no context for the ostensible impetus behind King’s campaign, the daily experience of ordinary black men and women in the sixties South; “Selma” teaches us far more about the personality of Lyndon Johnson than it does any black person, outside of King’s small coterie of fellow activists. The “historical accuracy” of “Selma” – its procedural detail – is meant in part to convey a sense of grown-up sophistication, an intellectual version of the “production value” advertised in old Biblical epics. It’s what marks the film as prestigious, worthy of the moral validation of the Academy. Everyone has their superiority complexes affirmed: the moral superiority of the Academy, and the intellectual superiority of critics, who can judge the movie based on its historical fidelity (and not kid’s stuff like artistry or entertainment-value.) Its essential political and spiritual vacuity also allows those spoiling for either a grandstand or a click-baiting polemic (as in West and other leftists’ takedown of the equally hollow “American Sniper”) to project their own pet causes or pet peeves upon it, itself also a form of ego-mania. But oftentimes when we affirm our own ego, we are just hiding underlying ignorance. “Selma” doesn’t challenge its viewers, because such provocation is the opposite of self-congratulation. And in not challenging themselves, the filmmakers failed to see the story lying just outside their own narrow conception of the facts. Clint Eastwood at the 2005 Oscars. Courtesy of Hitfix. I’d like to return for a moment to the question posed by VanAirsdale: is Oscar-bait good for the movies? Over the course of this essay, I’ve argued that the common denominator between “Selma” and “Sniper” is that both depoliticize and dumb-down their subjects. I’ve also posited the Academy as the root of these choices, since both films were likely greenlit as Oscar-bait. Now I’d like to answer a different question: why the Academy doesn’t just permit, but necessitates such a manipulation of the facts. The box office receipts for a movie in the 95th percentile of Oscar appeal — think a biopic released in December by the independent division of a major studio dealing with themes of political intrigue — will depend on how many nominations the film received. With zero nominations, the movie would be expected to make about $24 million; with one, about $40 million; and with five nominations, its receipts would grow to roughly $92 million. Given this risk, it behooves a risk-averse business – like say a movie studio – to do everything possible to satisfy its target demographic. For wannabe Oscar-winners, that’s the 6,000 or so members of the Academy, most of them part of the film industry, and all of them either a past nominee or nominated for membership by one. This means that the people responsible for selecting Oscar winners – who are pretty much the lone guardians of art in American cinema, according to VanAirsdale – have a vested interest in treating the awards as a form of image-control. It’s worth pausing to meditate on what a bizarre state of affairs this is. Imagine if once a year Nike tailored a sneaker to appeal – not to consumers – but to the corporate boards of Reebok and Sketchers. The resulting monstrosity would no doubt be freakishly solicitous to the tastes of middle-aged corporate executives with a passion for golfing and polo. I’d argue that there’s something distasteful, something sour and unhealthy in the sort of films this system encourages. “Depoliticization,” the word I chose, is really just another way of saying that a film reduces its characters’ struggle to a level enjoyable by all – which, almost by definition, will be determined by the lowest common denominator. It reduces history to a morality play. The real-life Civil Rights movement of the sixties was the mobilization of a people against a sophisticated panoply of arguments, ideas, and traditions, all of them commanding truth and reason in their own local pockets (William F. Buckley defended literacy tests for voting, and could point for vindication to all of the founding fathers.) “Selma” is about a herd of faceless, righteous saints standing up to some equally faceless bullies. Such a simplification turns the complex dilemmas of history into a series of easy answers. Besides being dishonest, there’s a good chance this damages our ability to successfully navigate future dilemmas, since real life surely won’t be as simple as our fantasies. And ironically, it aggravates the very polarization that spawned it, by teaching each side that the only reason their opponents don’t see the “obvious” answer is willfulness or bad faith. The stakes wouldn’t be so high if it weren’t for the fact that, as VanAirsdale shrewdly and correctly points out, the greenlighting of interesting movies depends, to an unprecedented extent, on the judgment of the Oscars. This increases the burden on critics and audiences to point out the excesses of films like “Selma” and “American Sniper,” as well as champion genuinely daring films like “Boyhood.” It might be the case, as VanAirsdale suggests, that Oscar-bait are now the only movies made “for grown-ups.” Or it might just be that the Academy has succeeded in turning all of us into children.